May 2002 General Election Campaign in the Republic of Ireland. "Everyone is equal before the law" - so says Article 20 of the CHARTER OF FUNDAMENTAL RIGHTS OF THE EUROPEAN UNION. The written Constitution of the Republic of Ireland also contains a similar statement regarding what is probably the most crucial, and the most basic, of all social principles: "All citizens shall, as human persons, be held equal before the law" (Item 1, Article 40). Despite the clarity and simplicity of the above two statements, and their immense social significance, some of the people living in the electoral constituency of East Galway are finding to their cost that certain individuals, and certain groups of individuals are (in practice) very arrogantly and very selfishly still putting themselves above the law: right now in Year 2002. Not only that, some - such as the local school authorities for instance (with their ongoing illegal sewage discharge arrangements into the river in the middle of New Inn village), are managing to sustain themselves in such positions for years at a time. Most important of all, there is now compelling evidence available on the Internet to suggest that those who indulge themselves in such anti-social activities, often (it appears) have the tacit approval and support of the most senior politicians and lawyers in the State; and, in the case of the Waste Management (Amendment) Act, 2001, it now looks as though senior politicians and State lawyers may have gone so far as to produce a law which they know is IN BREACH of Article 28A of the Constitution. How bad can things get? Item 1 of Section 28A of the Constitution states: "The State recognises the role of local government in providing a forum for the democratic representation of local communities, in exercising and performing at local level powers and functions conferred by law and in promoting by its initiatives the interests of such communities." The Waste Management (Amendment) Act, 2001 removes - among other things - the power that the democratically elected representatives of local government once had regarding the location of health-threatening superdumps of the kind being planned for the Parish of Bullaun & New Inn: and transfers such powers instead into the hands of a non-elected County Manager ??? Before signing the necessary papers which enabled the Waste Management (Amendment) Bill, 2001 to become law - in the form of The Waste Management (Amendment) Act, 2001 -President Mary McAleese had the option to ask the Supreme Court to test the constitutionality of the Bill. Despite the obvious conflict outlined above, and all the controversy and suffering surrounding it, President McAleese did not use this option it seems: and the question of why she decided not to use it remains entirely up in the air ??? Might it be because she and others in high political and legal places realised full well that - if asked to formally check it - the Supreme Court would have no choice other than to reject this particular Bill on the grounds that it was unconstitutional ? Much of our concern regarding the environment stems from the belief that for many people their local environment is the most important asset they have. After it became clear that repeated efforts to get help from within the Republic of Ireland were unlikely to EVER produce any useful results, petitions were then made to the European Parliament; and, these petitions are being considered at the present time by the appropriate bodies which have been set up within the European Union for such purposes. In addition to the above activities, a local person (Mr. Brendan Kelly) has decided to run for election in East Galway in the May 2002 General Election. He intends to run as an "independent" candidate, and he is focusing on the local problems of the particular parish (Bullaun & New Inn) that he and his ancestors have lived in for many generations. He is attempting to deal with the general problem on the basis that political and legal corruption is in all probability playing a major role in the difficulties of all local communities throughout the Republic of Ireland; and, that if the core problem of State corruption can successfully be challenged in one parish, it could have beneficial knock-on effects for all: provided of course that the people of other local communities get to learn of any successes which there might be in and around the Bullaun & New Inn area. Unfortunately, the national media in the Republic of Ireland have remained remarkably silent for the most part regarding the local efforts that are being made in East Galway to challenge the bad consequences of political and legal corruption: as they present themselves down at grass-root community level. Sadly, this seems to suggest that the Republic of Ireland media may themselves be part of the overall corruption problem. And, like the seven main-stream political parties perhaps (? ), that they have no REAL wish to be part of any "root-and-branch" type solution which might eradicate this sick (and sickening) social burden that has plagued human society for so long. 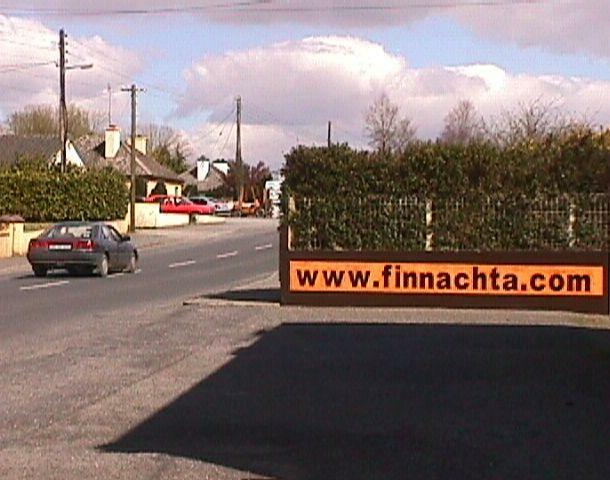 In an effort to try and get around what we see as corrupt media censorship of our efforts in the run-up to the election, a roadside sign has very recently been placed in the middle of New Inn village which enables members of the public to find the information on this page: regardless of traditional media outlets, and their ongoing efforts to keep this information hidden from voters. The State of the Republic of Ireland has only ONE written Constitution that is legally binding: and NOT seven different ones - as many in the main-stream political parties possibly imagine (?). With a view to co-operating in the Republic of Ireland's fight against State corruption, contact is now being sought with other like-minded people who are running (or thinking of running) for election in the May 2002 General Election. Adjective: 1. lacking in integrity; open to or involving bribery or other dishonest practices: a corrupt official; improper conduct. 2. morally degenerate and perverted; depraved. 3. putrid or rotten. 4. contaminated; unclean. 5. of a text or manuscript: made meaningless or different in meaning from the original by scribal errors or alterations. Verb: 6. to become or cause to become dishonest. 7. to debase or become debased morally; deprave; pervert. 8. to infect or contaminate; taint. 9. to cause to become rotten. 10. to alter (a text, file, etc.) from the original. Origin of word: from Latin "corruptus": spoiled, from "corrumpere" to ruin, literally: break to pieces, from "rumpere" to break. Noun: 1. the act of corrupting or state of being corrupt. 2. moral perversion; depravity. 3. dishonesty, especially bribery. 4. putrefaction or decay. 5. alteration, as of a manuscript. Copyright © 1999 to 2002 by William Patrick Finnerty. Except for short quotes of the kind used by Internet search engines (and by the media), the electronic text on this page may be not copied for any kind of commercial purpose without the prior written consent of Mr. William P. Finnerty (contact information provided below). IT IS PERMISSIBLE for any individual person to make a printed copy (or an electronic copy) of this page for their own personal use without seeking the author's permission. It is also permissible for anybody to print the www address of this Internet page in publications of all kinds; and/or, to provide electronic links to this page without seeking the author's permission. Web site design: William (Billy) Finnerty.